We had an eventful Valentine's Day this year. No flowers, or dinner and a movie. 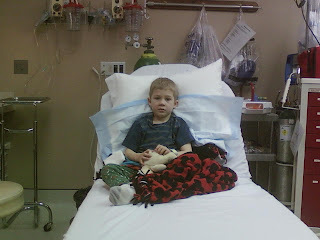 Nope, we spent 3 hours at Prosser Memorial Hospital with our youngest son instead. He decided he wanted to see if he could fly! He stood on the rail of the upper bunk bed and jumped off. The boys had their pop-up tent set up in their room and he was trying to land on it. He forgot that the toy shelf was under the tent and he landed face (nose) first onto it. Monte & I were in the living room . . heard a thunk . . . then a wail. 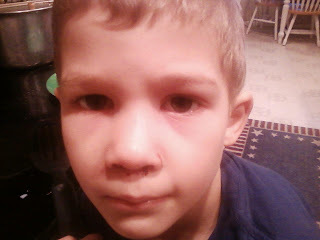 We rushed to see what happened and saw Andrew headed out of their room with his nose gushing blood. We got it stopped enough to see the damage and saw that he needed to go to the ER. Our neighbor gave him a quick blessing and we headed out. This is an extreme close-up of Andrews nose taken at the hospital. 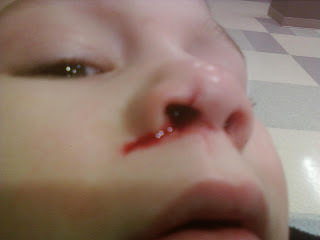 What appears to be a stream of blood coming out of his nostril is actually a 1/4" deep cut that starts inside his nose. they sealed it up nicely with a tube of DermaBond. Waiting for the Dr. - He was happy that we grabbed his blankie on the way out. "I thought I could land on my feet." After taking X-Rays, we discovered that his nose is broken :( So Andrew is the first of his siblings to have a broken bone. I'd say that this was a rough one to start with! This is the morning after . . it's still very swollen but shows no sign of bruising yet. It does still bleed a little bit. He is not quite his usual self today, but it's got to hurt, so we'll let him lay low for a day or two. It's the least we can do. Who knew that filling the dog's water dish was so splashy that it required special equipment to get the job done right? Andrew's "stunt" - the pre-K kids did a cheer while sitting on the girls' shoulders - Andrew and Hailey are 3rd from the left. Nat's cheer - she is to the right on the girl in white pants. Kaylee & Colten's cheer - Kaylee on the right in gray pants and Colten is in the middle back doing a stunt with Jessica & Courtney. The kids all had such a great day! Thanks to the Chiawana Cheerleaders and their coaches for a job well done! This year for Thanksgiving we drove over to my sisters house in Oak Harbor. Our friends John, Coren & Jessica came as well and Monte John & Jessica spent a good deal of the weekend SCUBA diving. They made several dives on Thursday morning at the Keystone ferry landing in Coupeville and dove off a boat near the San Juan Islands on Saturday. On Friday morning we packed up the kids and a couple of nephews (Ethan, Cayden & Keaton) and rode the Keystone ferry over to Port Townsend. We were only 100 miles from Forks, but I couldn't convince anyone to take me there for a Twilight Tour :( Party Poopers they are! We had a really great time discovering Fort Worden instead! After playing a bit at the fort, we went into Port Townsend for some lunch. We ended up at Nifty Fifty (or something like that). It was an old fashioned soda fountain shop. There was even a big juke box and mini ones at the tables. I think we spent a good $5 alone on those. We had greasy burgers and fries and root beer. It was really good! These two cousins were inseparable that day. They had such a great time! After lunch we headed back to the fort to play on the beach . . . it was pretty cold out as the sun was starting to set . . but they all still had to chase the waves. Luckily no one got caught!! I love this picture of Keaton - it was really dark in the fort and I was glad to get decent lighting for once. This is Andrew with his AWESOME teacher, Liz Elliot. The KK kids also went out toYellow Rose Nursery for a haunted forest, a "hay ride", games and a plant in a pumpkin activity. We invited out friend Ethan to join the trip. The "hay ride" - Ha Ha Ha! Andrew tossing gourds . . .
Spacey stay at home mom to 4 cute monkeys! Learning how to be a mom one day and crisis at a time.